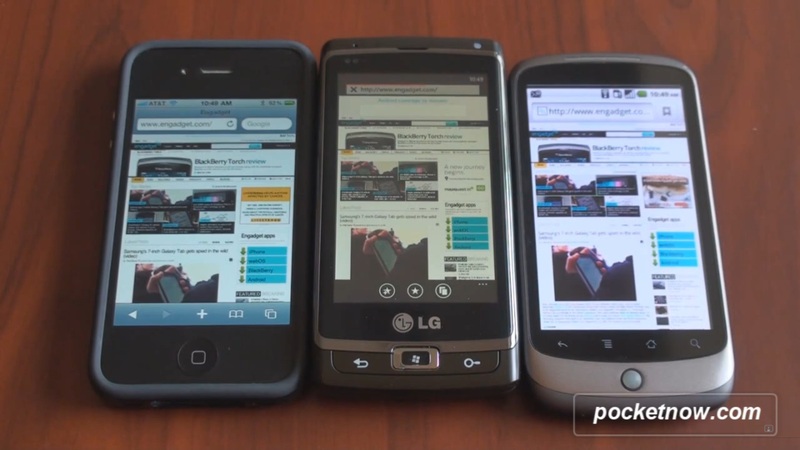 A new video from Pocketnow compares browsing speed on a Windows Phone 7 prototype from LG, the iPhone 4, and Google’s Nexus One on Android. Even though the software’s not finalized yet, Internet Explorer on Windows Phone 7 is surprisingly competitive with the WebKit-based browsers on the iPhone and Android, beating or matching them in most tests. No Flash, Silverlight, or HTML5 A/V support yet, but the browsing experience is at least on par with the competition and at least won’t be a hindrance to the platform’s success. While the rendering engine is a mix of IE 7 and 8, Microsoft has clearly put a lot of effort into the user experience, with silky-smooth scrolling, multi-touch zoom, and tab management. It’s a completely different animal from IE Mobile 6 on Windows Mobile 6.x (though most WinMo owners use Opera Mobile or other browsers in any case).